Every since I have taught math I have noticed that students are not big fans of logarithms. I think it may be because when they are in Algebra 2, logs seem so different from everything else they have done so far in math. To solve a quadratic equation, you apply the square root; the inverse of x squared is the square root of x. Equations they can easily solve like that make sense to them. However, to easily solve most exponential equations, you need to apply the LOG. Log doesn’t look like the exponential function at all, and I think that is where the confusion begins. So this year, I started with a simple Zombie Word Problem (from Wendy). The crisis? Students were turning into Zombies at an exponential rate! How many hours until our entire student body (1002 students) were ALL Zombies? The catch? I had not taught logarithms yet. I had never even said the word LOG in class. We had only done exponential functions and equations. My students were knew how to solve equations like 2^x=8. But, when given 3^x=1002, they were stumped. 3^6 was too small, and 3^7 was too large. I insisted they could find a solution, and to try things. They did amazing work. After determining that we would all perish between 6 and 7 hours, they started the slow process of plugging decimals. Every minute counts! They also went to Desmos. Some kids even spent quite a while plugging in numbers until they got the EXACT answer. But many of my students remarked, “Is this how we are supposed to do this, just by guessing?” I explained that they were not merely guessing. It was a method that worked, derived from an original estimate. But, they said, this takes too long. “THERE HAS GOT TO BE AN EASIER WAY!” I finally relented (wink, wink) and showed them the LOG feature. Some of my students had heard of logarithms, and already had a negative opinion of them. But today they were all happy to meet logs because it was such an easier method. And now they were very curious to know what the heck this log thing was and WHY it worked. Boom. Today, awesome hook for instant interest in logs; tomorrow, inverse functions to show why logs work. This entry was posted in Algebra 2 and tagged exponent, exponential equation, exponential function, log, logarithm by I Speak Math. Bookmark the permalink. Oh! That sounds interesting! We have computer programming at my school. I really will get back to you on this one. I am thinking about a post on this as well, but you come first. If x1 is an estimate whose square is less than 2 then 2/x1 is another estimate, whose square is greater than 2, so we take the average x2=(x1+2/x1)/2 for a better estimate. This is dead easy on a calculator. Try it for root(3) as well. A more general mid point method requires two estimates at each stage. Then x3=(x1+x2)/2 is a better estimate. Convergence is rather slow. 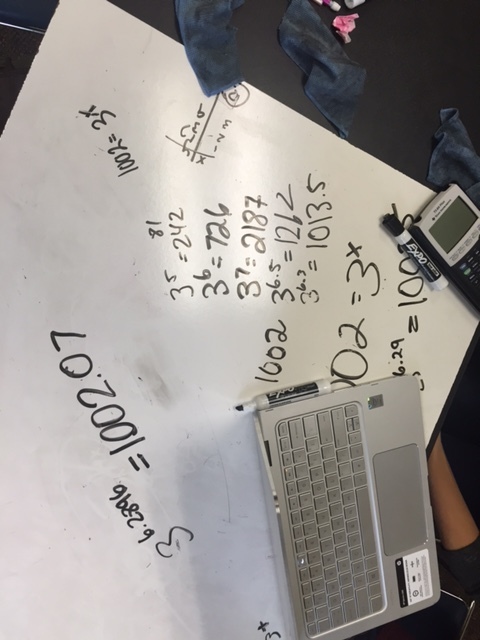 10 steps to get 3 significant figures in the estimate. The second one is an improved method, using the chord. zomibies always hook ’em…now for trig functions to write, Zombies that reveal themselves at low and high tides??? I made a quick little extension starting with the zombie idea, incorporating the number of zombies I can kill per minute. Basically, how many zombies do I have to kill per minute so that the number of zombies doesn’t take off to infinity? Oh!! I love that! Thank you!! Hey Julie, I saw this on Dan’s blog… great stuff!! Thank you! I’ll check it out. I would love to add more to my lesson.